Do you know the first name of this child? A black and white large format negative of the Eastwood child taken on April 12, 1947. In this view she is sitting with her feet crossed and her hands are on her legs. 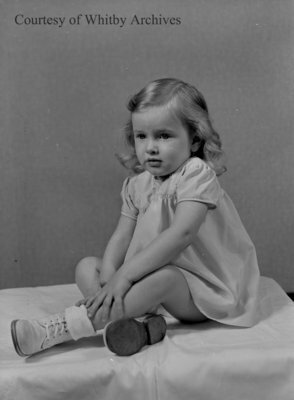 Eastwood Child, April 12, 1947, Marjorie Ruddy. Whitby Archives A2013_040_544.